According to a new AAA survey, two out of three drivers do not trust auto repair shops in general – citing overcharges, recommendations for unnecessary services and poor past experiences for their lack of confidence. However, the survey also reveals that the majority (64 percent) of U.S. drivers have singled out an auto repair shop that they do trust, suggesting that consumers have prioritized finding a reliable mechanic in an industry with an imperfect reputation. With today’s cars collecting a variety of data about the health of the vehicle, drivers need a trusted repair facility more than ever. “Connected cars” with built-in diagnostic capabilities can alert drivers to vehicle trouble and help repair shops quickly and accurately address issues. Unsurprisingly, given concerns about data security, AAA found that the majority of U.S. drivers want the ability to direct their vehicle’s data to the repair shop of their choice – the trusted facility with whom they have built a relationship. Baby boomers are twice as likely as younger generations to fully trust auto repair facilities in general, with one-in-five reporting they “totally trust” the industry. Baby boomers (76 percent) are also more likely to have a chosen auto repair shop they trust compared to Millennials (55 percent) and Gen-Xers (56 percent). Look for a repair shop before issues occur. Ask family and friends for recommendations and visit AAA.com/autorepair to locate an AAA Approved Auto Repair facility near you. Research potential repair shops and find out how long they have been in business. This can be a good indicator of shop quality. Also, look into how they deal with consumer complaints. The Better Business Bureau, State Department of Consumer Affairs or attorney general’s office can provide those complaints. Visit the auto repair shop for a minor job such as an oil change or tire rotation. While waiting, talk with shop employees and inspect the shop’s appearance, amenities, technician credentials, and parts and labor warranty. If you find the service to be good, stick with them. Build a relationship with the technician so they can get to know you and your vehicle. AAA’s Approved Auto Repair (AAR) program was created more than 35 years ago and includes nearly 7,000 facilities across North America with more than 500 located in Southern California. Once a shop meets AAA’s high standards, including certifications, technical training, cleanliness, insurance requirements, it becomes part of the AAR program where it’s re-inspected annually and monitored for customer satisfaction. 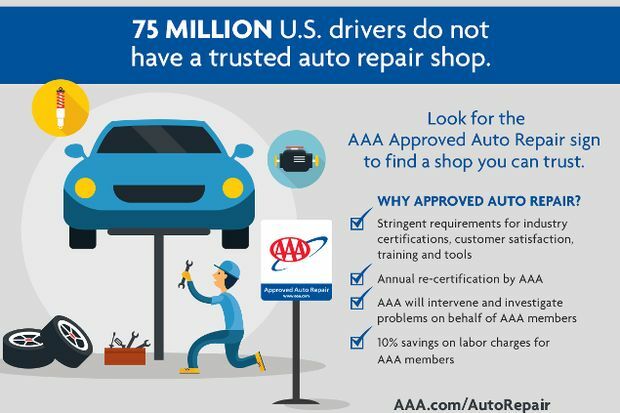 AAA members receive several unique benefits by selecting an AAR facility, including priority service, a 24-month/24,000-mile warranty, discounts on repairs, free inspections, AAA assistance with dispute resolutions and more.